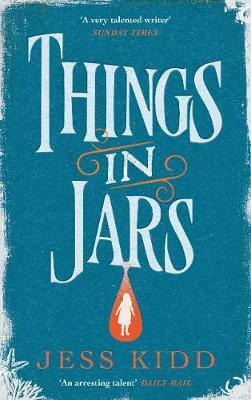 Things in Jars in Kidd's 3rd novel. Set primarily in 1863 Victorian London, we follow Bridie Devine, flame haired detective living with her 7ft tall housekeeper Cora. Bridie is still recovering from her last case so she's surprised when she's approached to find Christabel Berwick. But Christabel is no ordinary child, she has teeth like a pike, a burning bite, attracts snails and newts and can pull the deepest of memories out of your mind. Throughout this mysterious case, Bridie is accompanied by the ghost of of a tattooed pugilist Ruby Doyle. Bridie and Doyle takes us around London trying to find Christabel and to discover who and what Christabel is. This is my first Kidd book and at first I wasn't sure what to expect. There is such whimsy and fun in the writing at times but not too much that it was overly try hard. Once I got used to the flow and bounce of the prose I really enjoyed it. Kidd conjures up Victoria London so well, the sights, sounds and smells of city leap off the page. I loved Bridie. Smart, feisty, complex and quirky without feeling like a stereotype. We learn of Bridie's past too, how she came to possess the knowledge and skill of surgery that would see her working in the medical profession if she wasn't a woman. While there's plenty of fun in the book, Kidd also does an excellent job with the villains in this, the fear was palpable at times. As someone who enjoys books set in the Victorian times, especially with a female protagonist, it's up there with my favourites. The supernatural, mythical element added something new and fresh. I'd love to see these characters again for another book! Charming, strange but beautiful.